Founded in 1920 by the American Chamber of Commerce, in partnership with six American companies - Citibank, Dow Chemical, General Electric, General Motors, Ford Motor, and Goodyear – Graded School is a private, co-educational, non-sectarian, nonprofit day school from Pre-primary to grade 12. The school follows an American curriculum with instruction in English. The Lower School consists of the Montessori Pre-primary program (three years old through Kindergarten) and the Elementary (grades 1-5). The Middle School runs from grades 6 to 8. The High School program prepares students for admission to competitive universities, and all graduates receive an American High School diploma. Students also have the opportunity to earn the International Baccalaureate and Brazilian High School diplomas. You may find in-depth information in the Annual Report. The school employs over 152 faculty, with an average tenure of eight years and 60% holding advanced degrees. 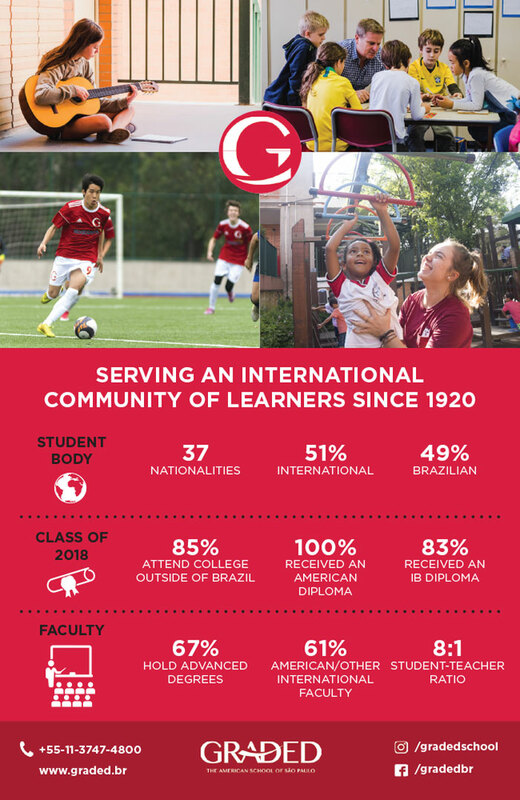 Graded School is accredited by AdvancED and the Brazilian Ministry of Education. We are an IB World School, authorized by the International Baccalaureate Organization (IBO). The school is also a member of the Association of American Schools of South America (AASSA), the US National Association of Independent Schools (NAIS), and the American Montessori Society. You can learn more in AdvancED's 2013 External Review. Graded is also a registered examination center for the International Baccalaureate (IB), all College Board exams (the SAT, SSAT, PSAT), and the ACT. Graded is governed by a self-perpetuating board, whose twelve members are appointed for up to four two-year terms. The Board was first established in 1931 and continues to set the school’s fiduciary policies, annual budget, and fundraising goals based on input from the Superintendent and the Leadership Learning Team. The Board stewards the school’s financial resources to provide for current needs, while at the same time protecting and enhancing the endowment for the benefit of the school’s future. The Board is also responsible for hiring and evaluating the Superintendent.